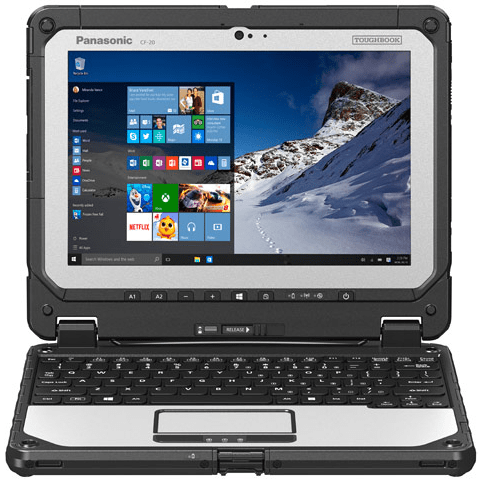 Panasonic has just debuted a new type of convertible 2-in1 laptops and in same time updated its rugged Toughbook line of laptops. This new model of convertible laptops is not afraid of dropping or splashing, it comes rugged and topped by magnesium alloy framing that give to the machine incredible durability features. The world’s first fully rugged detachable laptop, Toughbook 20 comes designed for MIL-STD-810G, this gives it a protection against dropping, vibration, rain, dust, altitude, humidity, low and high temperatures and explosive atmosphere. It comes IP67-certified to resist all weather conditions and has raised bezels to increase the protection toward LCD screen. Housing a 10.1-inch multi-touch IPS screen with a resolution of 1920 x 1200 pixels, and anti-reflection and anti-glare treatments. Sports an 8 MP rear-facing camera with auto-focus, triple LED flash, along a 2 MP front-facing webcam. The tough convertible tablet-to-laptop Toughbook 20 runs on Intel Core m5-6757 vPro processor which runs at 1.1GHz but can be boosted up via Intel Turbo Boost Technology by up to 2.8GHz of speed, backed by 8GB of RAM, 128GB of internal storage, expandable by up 512GB and will ship running Windows 10 Pro operating system. The connectivity terms involve the 4G LTE network support with satellite GPS, Bluetooth 4.1, one USB 3.0 port, micro SIM card, and Wi-Fi 802.11a/b/g/n/ac. Toughbook 20 by Panasonic gets powered by a 2,600 mAh battery, weighs 3.9 lbs, and will start shipping by next February for an exact price of $3,099.